Want a concert stripped of the special effects and jam-packed with pure, raw vocals? Want music with soul? Want songs sung so passionately that the energy required to simply sing one song would exhaust most singers out there today? 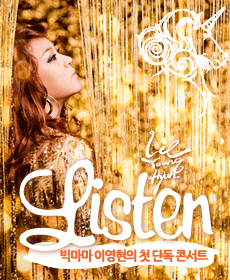 Don’t miss out on Lee Young-hee’s first solo concert. Many people know her from the talented group Big Mama, but she’s finally stepping out on her own, bearing it all. She will be singing many of her songs including “I’m Sorry Because I Love You”, “One Way Love”, “Lives In My Memory (feat. 4Men), “Can I Love Again”, etc. She will also be doing covers of Lee Eun-mi’s hit “I Have A Lover”, Baek Ji-young’s “Don’t Forget”, and “Listen” from the musical “Dreamgirls”. Expect to be blown away by Lee’s vocal talents, arguably one of the very best out there on the scene today. 2011 Hong Kyung-min Small Theatre Show "Talkcert"